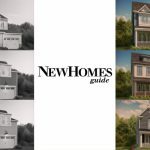 Each year for the past 35 years, the National Association of Home Builders has partnered with an array of architects, builders, suppliers and consultants to develop “The New American Home” in conjunction with the annual International Builders Show. 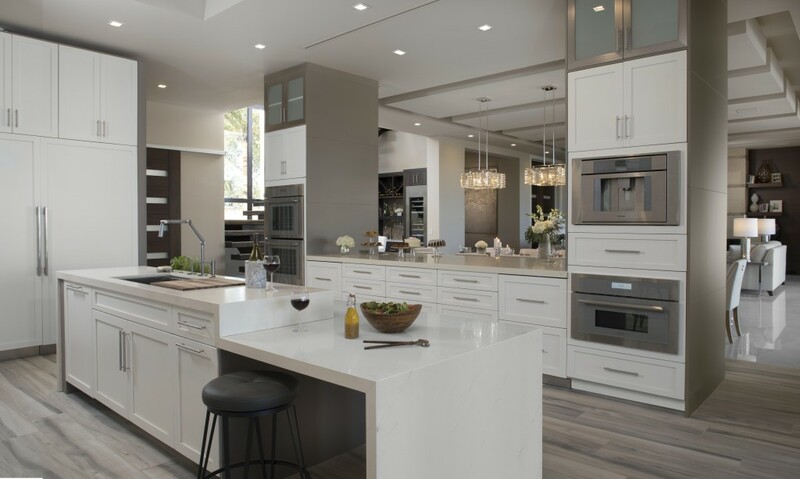 This year, approximately 85,000 building industry professionals from around the globe attended the show and most of them visited the modern Tuscan-style show house designed by architect Greg Hyatt of Hyatt Design in Orlando. 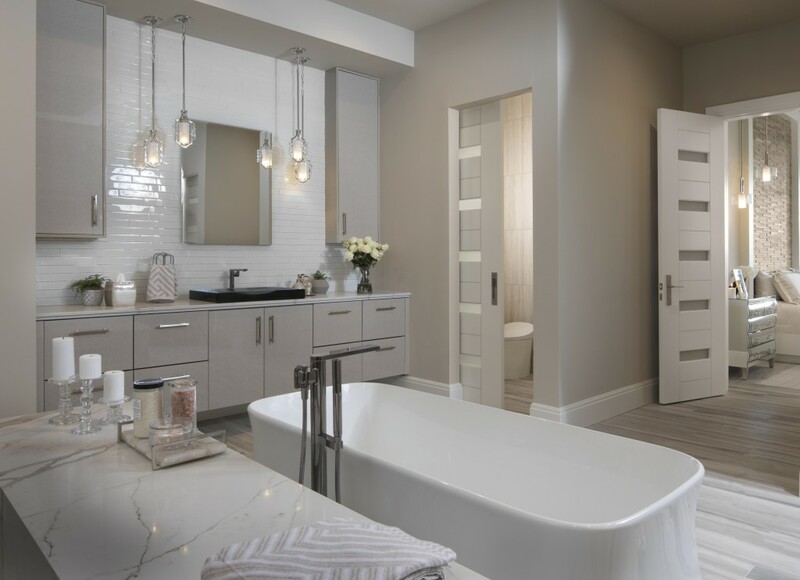 Built by Legacy Custom Built Homes, which is based in Winter Park, Florida., the more than 6,700-square-foot floor plan provides a glimpse of the style and products that buyers can expect in the coming years. Suppliers donate their products, which are used to demonstrate innovative building techniques, energy-efficient systems and cutting-edge fixtures and finishes that can also be viewed at the annual convention. Built in Bella Collina, a private gated golf and lakefront community west of Orlando, the exterior needed to feature Tuscan elements to fit in with the architectural style of the other custom homes in the development. 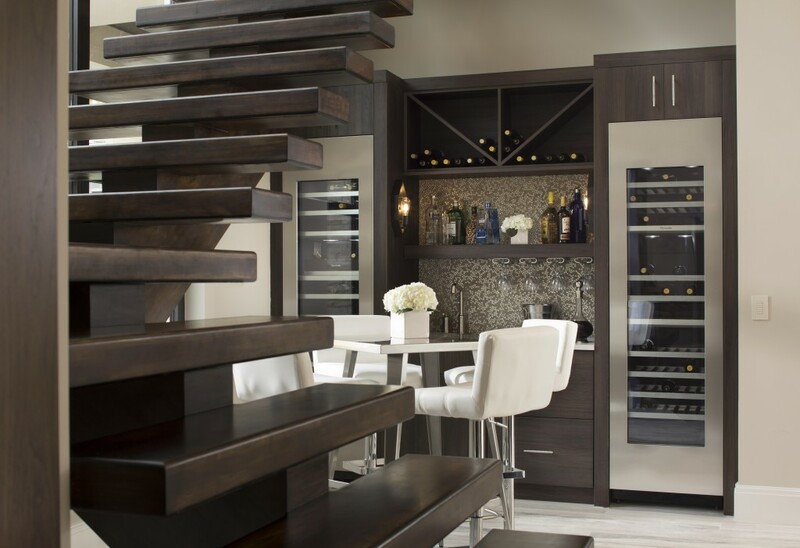 Hyatt and interior designer, Kate Clarke of Legacy Design, added tall contemporary windows and a dramatic floating staircase for a modern look. Nearly every room in the house has a private or shared outdoor space, including patios, courtyards and balconies, all accessible through retractable glass walls. While the Florida climate lends itself to year-round indoor-outdoor living, the flexible floor plan, warm earth tones and extensive use of wood in the house easily translates to a more Northern location. The house is built on a large lot that slopes down to the edge of the lake with cascading patios that surround the contemporary fire pit, swimming pool and spa. Glass walls throughout the house add a modern vibe and allows natural light and air to filter throughout every room. The H-shaped house, which has two two-car garages, has a central great room that can be expanded or contracted by opening or closing glass walls. The great room has a fireplace at one end with a seating area, a large dining area and a breakfast bar leading into the open kitchen. Entertaining on a grand scale can be accomplished in the great room, particularly when the glass door opens onto the covered porch that shares the same flooring as the great room for a visual connection. Another wall of glass links the lanai with the pool patio. 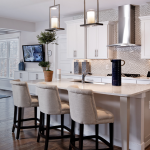 The kitchen provides the latest in upscale appliances and design elements, with white shaker cabinets, white counters and gleams of metallic detailing in the backsplash and range hood. 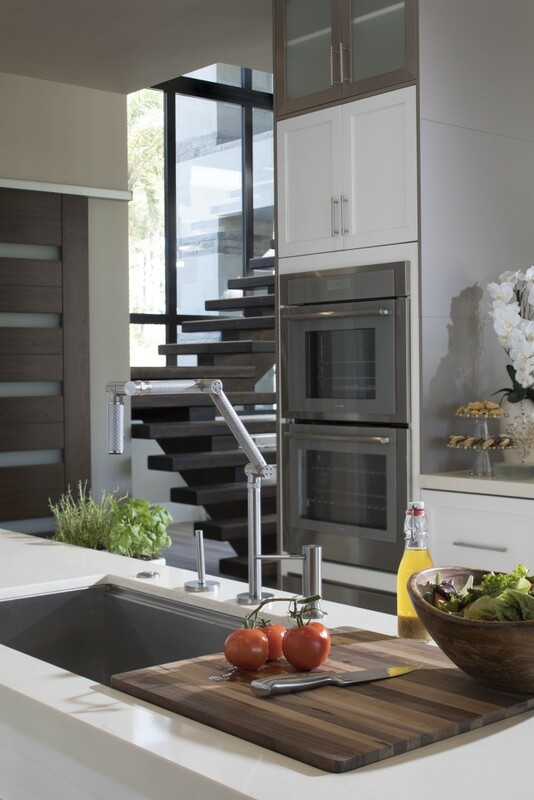 Thermador appliances include a built-in coffeemaker, a steam oven and a convection oven. The center island includes ample storage as well as a seating area for casual dining and chatting with friends and family while cooking. A second island provides additional storage and a buffet when entertaining. A walk-in pantry between the kitchen and game room handles food and drinks for a crowd. 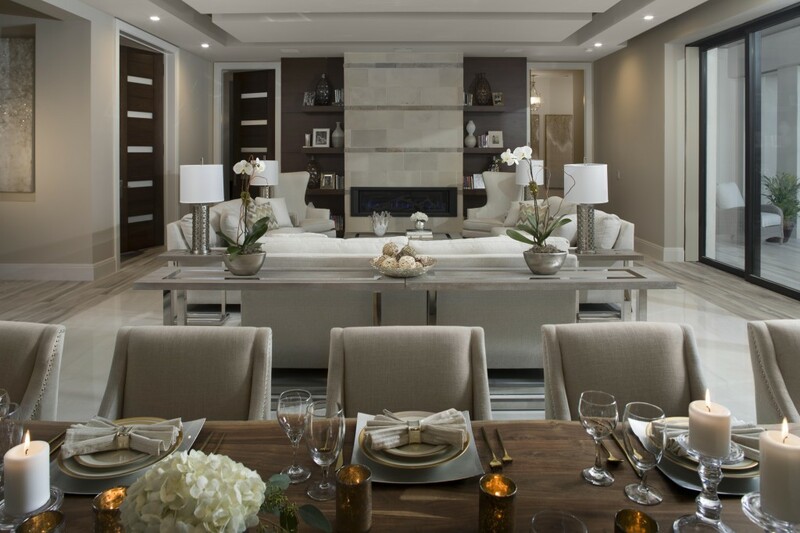 The ability to open and close various sections of the house makes it easy to turn the large house into a more intimate space. The main level includes a sumptuous master suite and an extremely private guest suite with its own bathroom and its own courtyard, which works equally well for a nanny, in-laws or long-term visitors. The upstairs is configured with a mini-kitchen, wet bar and built-in coffeemaker, along with a small laundry room, a powder room and a central family room. Three bedrooms are on this level, each with a private full bathroom and access to a balcony. The layout works equally well for a family with young children or with teenagers or adult children or visiting grandchildren, since the homeowners have their private space on the main level. An elevator near the kitchen links the lower and upper level for accessibility. In addition to the great room, kitchen, lanai and swimming pool area, the main level includes another covered porch next to the game room, which has a wet bar. One more covered porch extends beyond the game room toward the lake and includes an outdoor kitchen and bar. Each porch includes automated shades to maintain shade and keep out insects, as well as glass walls to close during a storm or a hot day. On the opposite side of the swimming pool is a covered porch attached to the master suite by a wall of retractable glass. 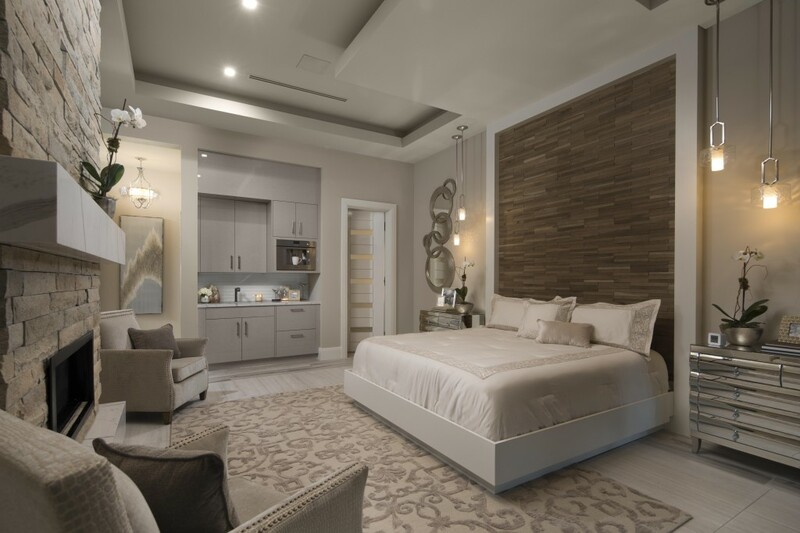 The master suite includes a gas fireplace surrounded by stone and a rustic wall behind the bed, which has LED lights underneath so the bed appears to float. The master bathroom has his-and-hers everything, including two walk-in closets, separate vanities and separate water closets. A freestanding tub sits in the middle of the bathroom on top of a floral mosaic floor; behind it is a glass-enclosed shower with numerous showerheads that have automated, programmable controls for each user. The main level also includes a home office between the foyer and the master suite which is also close to the home’s “command center” for its automated lighting, temperature control, automated shades, entertainment systems and security system. 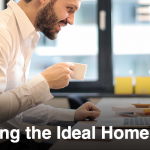 The home can be configured to work as simply as possible for a technophobe or as complex as possible for a buyer who enjoys experimenting with the latest technology. This level also has a mudroom with extensive storage and a laundry room with more storage. One of the master bathroom’s walk-in closets has a stacked washer-and-dryer for a total of three sets of laundry equipment in the house. In spite of the abundance of square footage, the indoor-outdoor floor plan and high-tech features, this house also demonstrates the latest in energy efficiency and green features. Super-insulation, energy-efficient windows and doors, tankless gas water heaters, an innovative energy-efficient heating and air conditioning system and automated lighting and temperature controls all work together in the house, which is estimated to be 36 percent more energy-efficient than the average newly built home. Whether you’re more intrigued by the smart house features, retractable walls or innovative design elements in the house, you can see more of it on the virtual tour here. 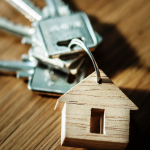 Originally appearing in the March/April 2018 edition of New Homes Guide, this story was written by Michele Lerner, a freelance journalist who covers real estate and personal finance. Photos courtesy of Jeffrey A. Davis. 2Buying a New Home? Here’s What You Need to Know About Rising Interest Rates.